I have not read any of the earlier stories in the Diving Universe, but I still thought this one was great. 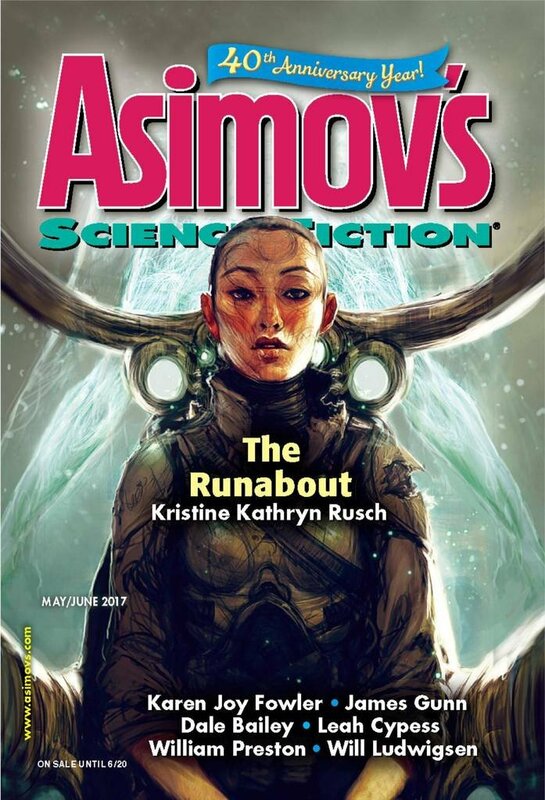 "The Runabout," by Kristine Kathryn Rusch [bio] (edited by Sheila Williams), appeared in Asimov's Science Fiction issue 05-06|17, published on April 20, 2017 by Penny Publications. Pro: The Boss’s main goal is to figure out the Runabout. Yash has a separate goal—to find the Fleet. Everyone else’s goal is to support/protect the Boss. The story divides into three separate dives. Each dive creates tremendous tension, each more than the one before. Each one also shows us more about the Boss and the other characters and how they relate to one another. The first, aborted, dive, involves the Boss, Elaine, and Orlando investigating the Dignity Ship but being interrupted by the awakening Runabout. The Boss realizes she’s vulnerable. It's remarkable how much this episode shows us about this universe without having to tell us through sterile narration. The second dive takes just the Boss and Elaine to open the Runabout, and they barely survive. They get it open, but pay a price for it. The third dive takes the Boss and Yash inside the Runabout, where they find some of what they wanted and learn a few answers. Orlando gets to be a hero rescuing them. The narration is transparent, with no perceptible info dumps. The dialogue is consistently realistic. Con: The character development is limited because we only see them when they’re engaged in the main task. As a result, we don’t get attached to any of them, and there’s no emotional impact at any point. This is one where it seems like we read different stories. ;) I thought this was *terrible*. As in the other Diving stories, Rusch treats working in vacuum as though it's akin to scuba diving. I was constantly kicked out of the story by Rusch's complete ignorance of physics and space: people maneuver between ships by *pulling themselves along cables with their hands*, the planet-born have noticeably heavier bones and muscles than the space-born of the Fleet even though all the ships have (apparently 1g) artificial gravity (because the latter grew up IN SPACE!!! I guess), and the magical, incredibly dangerous interstellar anacapa drive is apparently about the size of a shoebox, doesn't appear to be connected to anything else, and is sitting in a small compartment just below the floor a few feet away from the command chair on the bridge. Also, there don't seem to be any computers that are of any use whatever: ships have to be operated by humans, and all data needs to be looked at by eye. But deeper than all this, I thought the writing was terrible. The Boss doesn't actually experience any believable emotions in the course of the story, she just tells the reader she's experiencing emotions. You felt there were no infodumps; I thought practically the entire story was infodumps. The Boss is constantly explaining to the reader why the other characters are saying things and reacting the way they are, and half the dialog is just them debating the properties of the goofy, completely unconvincing anacapa drive. And I found Rusch's use of paragraphs frankly bewildering. I know I've read fiction by Rusch previously that I thought was quite good, but for me, this was 1 star. A waste of my reading time. I'll admit I didn't even think about the zero-g maneuvering, and I completely missed the reference to bones and muscles. For me, the weakest part of the series is that ability to tolerate problems with an anacapa drive is hereditary. However, it's part of the what-if, and the author doesn't dwell on it. Where bad (or at least unrealistic) science spoils a story for me is if it's irrelevant to the plot (so it seems the author just threw it in there for atmosphere), if the author "explains" it in cringe-inducing detail, or if it pops up so late in the story that it amounts to a deux ex machina. As for infodumps, I think the big difference between "info" and "infodump" is whether the reader wants to hear it. In lots of cases, it's hard to imagine any reader wanting to hear the material in a dump, but in some cases, it really depends on whether you got into the story or not. I agree with you entirely on the lack of character development. Definitely the weakest thing about the piece. Anyway, I'm sorry it didn't work for you, but I think with any reviewer, there are going to be stories they loved that you hated and vice versa. That's part of why it's helpful to wait until the end of the year when you can see how many others recommended the same story. 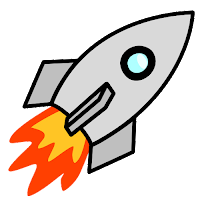 I do try to keep up with Asimov's, F&SF, and Interzone on a regular basis, and give everything in them a shot. Of the three, Interzone is the one I find to be the most consistent: I wouldn't say there's any such thing as "an Andy Cox story", but it has the smallest percentage of stories that just didn't work for me at all. Because of length constraints, however, most of Interzone's output is short stories, with the occasional novelette, which makes it a bit easier to persist if a story isn't to my taste. I probably nope out of a greater fraction of F&SF stories than the other two, but that's largely because I'm mostly not interested in High Fantasy or magic stories any more, so unless there's something really compelling in them I just skip out. At the end of the day it just comes down to a question of personal taste, as you note, and the best you can do is find someone whose taste is very similar to yours. (Or someone whose taste is diametrically opposed to yours - that works just about as well!) We seem to agree more than not, in my experience, and usually it's more a question of degree than here (and obviously Rusch's story worked for the editor, and she seems to have a fairly broad fan base). I think I have much more of a taste for ambiguity, in general, than you do: I'm a huge admirer of the fiction of Caitlin Kiernan, for example, whose stories (from the ones you reviewed here) clearly don't work for you at all. And I just checked and you loved Murderbot (hell, everybody but me seems to love Murderbot), which is something I just don't get. I read All Systems Red when Tor gave it away, and I thought it was perfectly serviceable, but that was all. Ah well, if everyone liked exactly the same things it would be a much less interesting world. If reviewers were random--"everyone has different taste"--then you'd expect a Poisson distribution, but the actual result is far more concentrated than that. P.S. Oh yes, I forgot to mention the "genetic immunity to physics" issue.